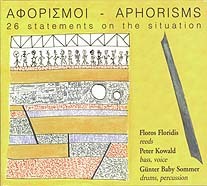 Floros Floridis, alto and soprano saxophones, clarinet, bass clarinet; Peter Kowald, bass, voice; Günther 'Baby' Sommer, drums, percussion. Recorded at Agrotikon Studios on 26/27 February and 14 April 1997. Cover painting (reproduced above) by Floros Floridis.